1. Network, Network, Network. A keynote speaker at a women's conference recently suggested that over 70% of people in society are introverts. Interacting with others, especially people we don't know, is a very extroverted act. It will require stepping outside of your comfort zone, but it's worth it. The contacts, learning, and interaction will boost your confidence and create great connections that you may need in the future. Be prepared to start conversations with strangers or ease into group discussions that sound interesting or where you have information or ideas to contribute. 2. Manage Your Energy. Pace yourself, because conferences can be exhausting. Most schedules are packed with keynote speakers, break out educational speakers, networking events and more. If you are not careful you can burn out on the first day. Decide in advance what you must do and what sessions or events you can skip if you don't feel up to it. Prioritize. 3. Have Learning Objectives. Why do you want to attend? What do you hope to learn at the event? Who do you need to connect with? What industry trends do you want to know more about? 4. Leave Your Work at Work. 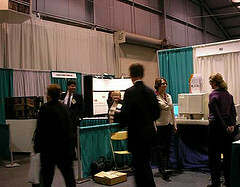 It is very common to see conference delegates checking emails, making phone calls, even participating in conference calls during breaks while at an event. Let people know you will be away, and set up your voicemail and email autoresponder to notify people that you are not available. Do whatever you can to keep your work obligations from stealing your attention from your educational investment. 5. Network with Vendors at the Trade Show. These are industry partners who can show you new technologies or products that can dramatically enhance your work. Bright displays help spark your imagination and engage conversation that can help your organization be more efficient and effective. Plan to visit as many vendors as possible. As a speaker at a conference, I love visiting with vendors at the trade show. The trinkets they give away have been lovingly designed and thoughtfully displayed. My friend Sanja is a fabulous net worker. She is my go- to person about what's up in our city. She is connected and knows what is going on and best of all is prepared to help others by facilitating contact and connection. I thought I would draw from her experience to help people get the most from a conference networking experience. When I am a motivational keynote speaker at conferences I often find people sit with people they know and are comfortable with instead of venturing out and learning from the diverse wealth of experience in the room. Be prepared to meet a lot of people; bring business cards and decide in advance how you will follow up with people, LinkedIn, Facebook, Twitter, Email? Networking Wizard Sanja says the key to her success is to be prepared to help others. When I am a motivational keynote speaker at a conference I sometimes do some networking activities to facilitate meeting others. Remembering details about someone like family members or significant accomplishments can be a great way to reintroduce them and make them feel important later on. 6. Follow Up. Collect business cards from colleagues and vendors and stay in touch through Facebook, Twitter, or Linked-In. Send a quick email reminding people of your conversation at the conference. 7. Share What You Learn with your colleagues. It will reinforce your own learning, strengthen your team, and make it easier to negotiate attending the event next year.